Post Protectors For Warehouse Rack | ACE Industrial Equipment, Inc.
Post protectors help protect warehouse rack from damage from forklifts and pallet jacks. Post protectors are a must have for any busy warehouse operation. Post protectors can save money by protecting your rack investment, but more importantly can help prevent serious injury or death from a rack collapse. Size & Specs: Welded design is triangulated to deflect impacting loads. Made tough 7 ga. steel. Base plate is 8″W x 6″D. 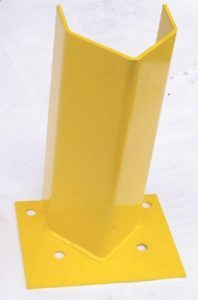 with a 4″ column opening 5/8″ anchor holes provided for 1/2″ x 3 1/2″ wedge anchors (supplied by others). For more information on our post protectors call us today at 1-800-300-6034.